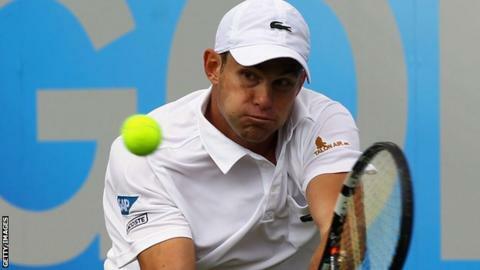 Former world number one Andy Roddick has accepted a wildcard into the Aegon International in Eastbourne. The 2003 US Open champion was knocked out of the current tournament at Queen's Club in the second round. Meanwhile, British women's number one Anne Keothavong is among four British players to have been awarded wildcards for the main draw. Heather Watson, Jamie Baker and James Ward will also feature at Devonshire Park next week. British number three Watson, who is ranked at 111 in the WTA rankings, was reached the third round of the Aegon Classic in Birmingham before losing to world number 20 Roberta Vinci. Two more wilcards for the WTA tournament, which was won by Marion Bartoli last year, are still to be announced. Meanwhile, American Roddick, 29, who was runner-up at Wimbledon in 2004, 2005 and 2009, said: "Players talk about the laid-back atmosphere at Eastbourne. "I'm really looking forward to putting the finishing touches to my Wimbledon preparations on the courts down there."